By homeschool group hug Last Modified: April 3, 2016 10 Comments Any post on this site may contain affiliate links. If you use them, they cost you nothing extra. We make a small commission. If, like me, you have a homeschooled child approaching high school age, well done! Give yourself and your child, heck, give your whole family, a big pat on the back. Not many of us make it this far. Have you noticed that most of the mums in the online groups have tiny tots? Did you spot that the bulk of the kids at homeschool group are under 10 ? When was the last time you clicked open a homeschooling blog and saw children above waist height? Not many of us make it this far, for many reasons. I’m sure you can imagine that some kids want to go back to school, some parents can’t cope any more, some families need to revert to double incomes and sometimes, high school just seems too daunting. Well done to all involved for having a crack at it, I’m sure even one or two years of learning at home will have enriched and improved childhood and family life. But here I am, with an enormous boy of 11, almost as tall as me, facing homeschooling into highschool. please help us by pinning to Pinterest, or sharing in your preferred way. Just to put the record straight, we’re not the sort of homeschoolers who buy boxed curriculum and have timetables. That will never be us in a million years, we’re ultra relaxed, verging on unschoolers. 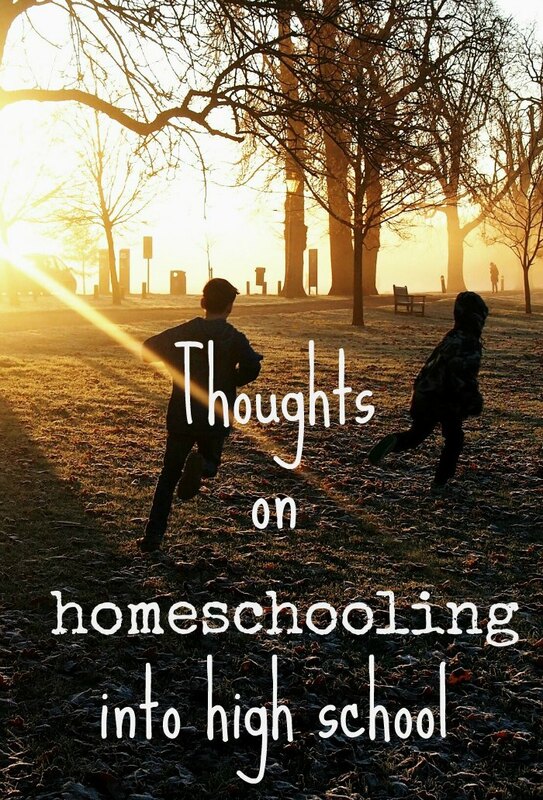 I use homeschool as an umbrella term to cover it all. Mostly, we worldschool, we travel full-time and have done for 2.5 years. So whatever homeschool hat you wear, this post is for you. As I see it, we’re all the same, joined, connected and intertwined in wanting the best possible education for our kids. READ NEXT BLOG What is Deschooling? I have two happy, healthy kids with a great knowledge base and excellent life skills. That’s a great result. What more could anyone ask? We have a strong bond and a good relationship born of spending so much time together. There are no secrets, resentments or unknowns. We’re tight-knit and comfortable. There have been times I’ve faltered and worried, concerned that the reading or writing wasn’t at the point it “should” be but now, at 11 years old, everything feels fine. Son 1 is bright, sparky, cool, happy, friendly, a voracious reader and a sponge for knowledge, most of it obtained in non conventional ways. He makes friends easily, with people of all and every age and background. I’m very, very proud of him. So if you’re faltering at 8 years old, at 9 or 10, have faith. Between 10 and 11, a lot changes! Homeschooler, unschooler or worldschooler, methodologies change, day by day, year by year as the whole family grows and develops. Adaptation is one of the beauties of our sort of education. If I tell you right now, today, how we’ll proceed right through to 18 years old, that blueprint for education will be obsolete within the year, maybe within the week, but here’s how I see things going. I will continue to support and encourage my beautiful, amazing son in anything he wishes to do. My son will not be returning to school to sit exams at 16 or 18. Unless of course, he wants to. I don’t think, at this point, that he will want to go to university, but that may change. I’m cool with that. We’ve discovered the British iGCSE system, I will encourage him to sit maybe 1 iGCSE of his choice, early, and see how it goes. If he likes it maybe he’ll want to do more. No school attendance is required, the kids just turn up and sit the exams. We will try to cover the content of the high school courses in our own way. I’ve bought course books for various subjects, including science, geography and religious education ( his choice! ), They are for me to read so that I can gently prod him in the direction of the learning experiences that will help him, should he wish to sit exams. I want to keep his options wide open. What I find, every time we buy a book, is that he already knows most of that stuff already, he’s picked it up through life and our travels. He is learning Romanian through immersion, if he wants to sit an exam in a Language, I feel this will be his choice. Or maybe he’ll revert to Spanish, his favourite thing to learn from our time in Central America. I will continue to get him to write or type , just for a very short time, whenever we have down time away from travelling. This approach is what he needs and has helped him improve his skills. He taught himself to touch type, through choice, the first glimmer of self-directed learning. He will continue to practice maths, again, something we’ve found beneficial. I think he’d love to learn a few extra skills, maybe play guitar or drums. He’s enthusiastic to practice archery. I’ll do my best to facilitate that. Because our life is non-conventional we’re in a position to invite travelling volunteers to live with us, maybe we can find a guitar player to while away a month or so on our mountain and share his gift. What I really wanted to say today is don’t give up. It will happen and come good. A year ago, on his 10th birthday, I was tearful and worried about our lack of obvious progress. There was no sign of this self-initiated learning actually happening. Now it’s started. I’ve seen it and it works. Stay strong, keep the faith, all will be fine. But what happens when girls become more interesting than Minecraft? I don’t know. That milestone is just around the corner. Thank you for sharing this – mine are 8 & 9 and we only started world schooling this year. I know my kids are doing well, but I spend a lot of time worrying that what we are doing/learning is not enough. This post has put me back on a positive path. That’s great to hear Liz, that’s pretty much why I posted. Thanks for commenting, this homeschooling site is a bit neglected, but I can grow it over time. Worldschooling is only one of the amazing things you do, Alyson – should your boys want to talk religion with anyone : I’m open for conversation! I teach religion (insofar it can be taught) to high-school kids and I am a theological scholar – you know how to reach me! I’d love that Talitha. We hope to get enthusiastic but very relaxed tutors for them in the coming years. Fantastic article. We homeschooled our children through high school and we would never go back and change that decision. We were active in various homeschool groups, and they enrolled in the local community college to attend a few classes. They are grown now, the youngest graduated high school in 2007. We cherish every minute of that time with our girls. Good to hear Debbie, thanks. Great to hear Julie. What’s MOOCS? They’re free online courses – we used the following: http://www.coursera.org; open2study and futurelearn. I don’t want to recommend any as its a personal choice, but I would suggest looking at a few topics on each one and see if anything is of interest. Same thing happened with us a big change with my oldest son between age 10 and 11 ?